The new American-themed burger restaurant opens for business in Southwater on Monday 17th April. TGI Fridays joins Prezzo in the new Southern Quarter development and brings something other than Pizza & Pasta to the complex. The brand was started in 1965 opening their first branch in New York and lay claim to inventing the Long Island Iced Tea cocktail, one of 500 you can order in the Telford outlet. 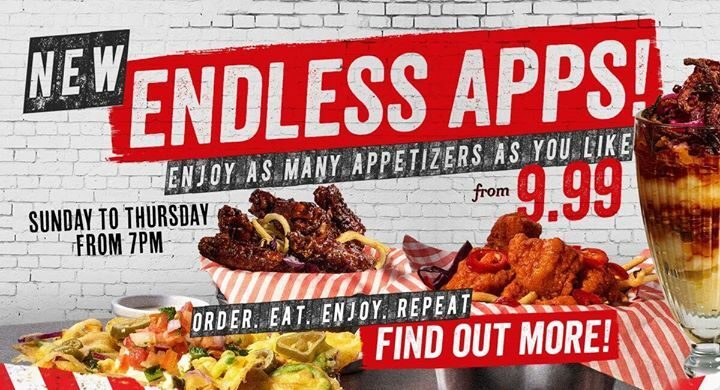 Offers include an ‘All You Can Eat’ appetizers for £9.99 and you can book tables online. Know anyone who could clear them out of starters?